Here's a perennial question: How much gas do I need for my Jetboil? And, really, this would apply to not only Jetboils but to any high efficiency stove set up. A one liter pot from Primus. Note the heat exchanger at the bottom of the pot. Generally, a "high efficiency stove set up" means an integrated canister stove (Jetboil, Reactor, Windburner, Eta Express, etc), but there's no reason that you can't go out and just get a heat exchanger pot and create your own high efficiency stove set up. Combine your existing stove with a heat exchanger pot, turn it down to a moderate flame, and you've got your own high efficiency stove set up. What's out there in terms of ready made high efficiency stove systems? You might want to take a look at my article Integrated Canister Stoves – The State of the Art. But back to the original question: How much gas do I need for my Jetboil (or other high efficiency stove set up)? The "de facto" standard for simple backpacking cooking is the "two cup boil" (about 500 ml). Why? Because that's what most freeze dried backpacking type meals require. Things like ramen also require about 2 cups of water as do other popular backpacking meals like Knorr's rice or pasta. Of course some meals require more and others less, but 2 cups/500 ml is a pretty good starting place. But of course, some people will have hot meals once per day, some twice, and still others three times per day. So, it's not just "two cups" that we've got to worry about but also how often we boil up our two cups. And of course, there are those who want a hot cup of coffee, cocoa, or tea with their meals. Let's look at three scenarios and see what we come up with. I'm going to arbitrarily set up these numbers for a five day trip, just as an example. You'll need to adjust these numbers if your trip is either shorter or longer. First, I'll briefly describe each scenario, and then I'll have a chart "doing the math" and comparing the three scenarios. There will be a discussion section after the numbers and charts. In Scenario One, I'm going to describe somewhat "minimal" use. Our backpacker here will not have hot food every meal but rather will have only hot food twice a day. So, somewhat minimal but hardly extreme. Now, this is a five day trip, but I'm going to assume that our backpacker will eat breakfast before he or she hits the trail on day one and that he or she will leave the trail after supper on the last day. This is usually the way I set up my trips, so I think this is a reasonable assumption. Therefore our backpacker will have four breakfasts and four suppers. Our backpacker boils 2 cups/500 ml for each hot meal. If you run your trips differently, adjust these numbers accordingly. In Scenario Two, I'll describe what I call "moderate" use. Our backpacker in Scenario Two will eat three hot meals per day. All else remains the same. In Scenario Three, I'll describe what I call "heavier" use. Our backpacker in Scenario Three will eat three hot meals per day and will have one cup of hot beverage per meal. All else remains the same. OK, so let's lay this out in a series of comparative charts. With a high efficiency stove set up, it's perfectly reasonably to boil two cups (500 ml) of water with 5 g of fuel. Of course you'll want to know the Rules of Stove Fuel Economy so that you don't wind up blowing your grams per boil. With "minimal" use, we use only 40 grams of fuel for a 5 day trip. That's pretty good! Since most small ("four ounce") size fuel canisters contain 110 grams of gas, we're totally covered with one canister. Nice. With "moderate" use, we're at 68 grams for a 5 day trip. Note that I used "4.5" as the number of days. I'm still assuming our backpacker will eat breakfast before starting and eat supper after ending, but recall that in Scenario Two (moderate), our backpacker has a hot lunch every day, so I add in an extra half day to account for the extra meal. I guess strictly speaking it should be a third of a day, but close enough. Again, we're well within the capacity of a single 110 g canister of gas. Even with "heavier" use, were still only at 101 g of fuel used. Yes, that might be cutting it a little close to bring a single 110 g canister of gas when you plan to use 101 g total. but if you ran low, you could forego you hot beverage at lunch on the last day. Now, these are fairly rigid scenarios. Every meal is the same. But even if you flex things around a bit, so long as you're not boiling more than nine cups/2.1 liters per day (and only six cups/1.4 liters on the first and last day), you're going to be OK with just one small size canister. That's pretty nice. That's the advantage of a high efficiency stove set up. When you can avoid sizing up to the next larger canister (or carrying multiple canisters), a high efficiency stove set up will likely save you weight overall. "But Jim! I have a Jetboil. Jetboil only sells 100 g canisters of gas. If I use a non-Jetboil canister the sky will collapse, I'll get a hair lip, and my dog will wet the rug." Uh, no. You can pretty much use any brand of canister with any brand of stove. Pretty much (there are exceptions). You might want to check out my article Can I Use Any Brand of Gas Canister? Why anyone would buy Jetboil brand small canisters when you can get more gas for the same price by buying another brand is beyond me. Yes, it's "only" a 10 g difference, but recall that a two cup boil requires only 5 g of gas with a high efficiency stove set up. You're giving up two meals every time you buy Jetboil brand small canisters. No, thanks. You should always use your own habits to estimate your fuel usage. Don't just rely on my scenarios. These scenarios are meant to stimulate your thinking not dictate your fuel usage. If you're new to this, you might want to be a bit more conservative in terms of your allotment of fuel than what I've outlined above. If you're melting snow to get water, double all of the above estimates. There's this sort of myth running around out there that somehow operating a canister gas stove at high elevation isn't going to work very well. Maybe, or so the story goes, you need to use white gasoline (or something) at higher elevations. This is a persistent myth that has been passed on, hiker to hiker, for years. I've even seen it on official Boy Scout websites. And it's just exactly that: A myth. 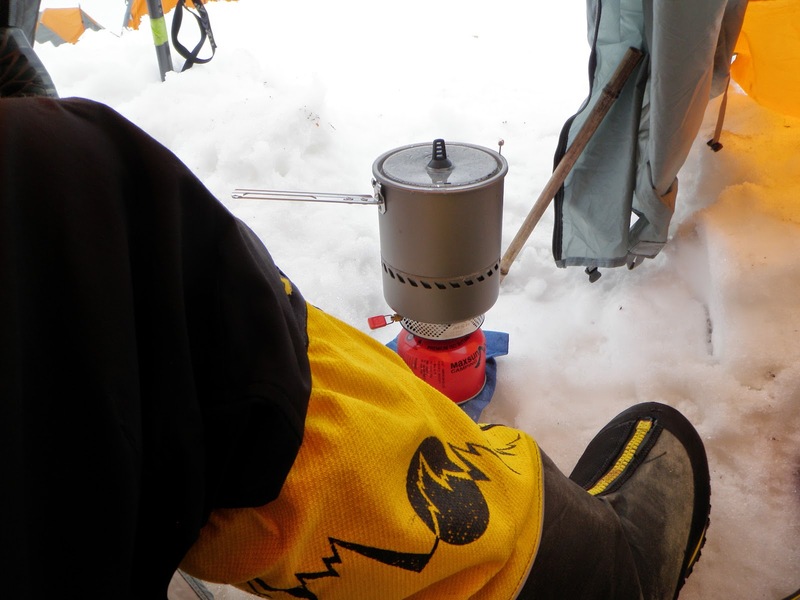 A Soto WindMaster canister gas stove running just fine at over 10,500' (3200 m) in the Sierra Nevada in California. The myth got its start back in the early 1970's when canister gas stoves started seeing more wide spread use. The fuel used back then was 100% n-butane. N-butane is a lousy fuel for cold weather. Backpackers at high elevations encountered something that caused their canister gas stoves to work poorly: Cold. And thus the myth was born. The myth is kind of fact based. Kind of. I mean gas stoves were genuinely not working well at high elevation – but the elevation itself was not the problem. The problem was actually the cold, and the problem would have been just as bad or worse at sea level. Thus, a misinterpretation of real events lead to the myth. The real problem was cold, but people wrongly concluded that high elevation was to blame. Now, you may be thinking: "Hikin' Jim, you big dummy, who cares why? It's still cold to this day at high elevation today, so my canister stove still isn't going to work." Ah! Not so fast. Take a look at a modern backpacking canister. Typically printed on the side or top you'll see something about propane and isobutane in addition to "butane" (n-butane). Yes, back in the 1970's they only had n-butane in canisters. Now, they include propane and frequently isobutane, gasses that both have much better cold weather performance than n-butane alone. Note that it contains not just plain butane (n-butane) but also isobutane and propane. When multiple gasses are mixed together, they form a blend that has far better cold weather performance. You still need to consider cold weather, but it's no where near the issue that it once was – and cold weather can impact a gas stove irrespective of elevation. The vaporization points of the three gasses commonly used in canister gas. The vaporization point of a gas blend lies somewhere in between the boiling points of the constituent gasses. If you are expecting cold weather, which brand of canister gas is the best to use? See: What's the best brand of gas for cold weather? There are still things to consider when using a stove at high elevation, but these considerations apply to all stoves not just canister gas stoves. The boiling point of water. As you climb, the boiling point of water decreases by almost 2 degrees Fahrenheit per 1000' of elevation gained (about 1 degree Celsius per 300 m). At sea level, water boils at 212 Fahrenheit/100 Celsius. At 10,000'/3300 m, the boiling point of water is 193 Fahrenheit/90 Celsius. Since the boiling point is lower, all else being equal, water boils faster at higher elevations. Cooking time. Since the temperature of boiling water is lower at high elevation, it generally takes longer to cook something. Note that this doesn't really apply to frying etc. but only to those types of cooking that involve boiling water. So, while it's faster to boil water at higher elevations, generally cooking takes longer, and you therefore may need more fuel when you cook at higher elevations. You can offset the need for more fuel by things like "cozy" cooking where you put your food in something insulative so the food will continue to cook even after you're done using your stove. You should also learn the Tips and Tricks of Good Stove Fuel Economy. A non-piezoelectric butane lighter. In other words, a common flint wheel type lighter such as a Bic brand lighter. 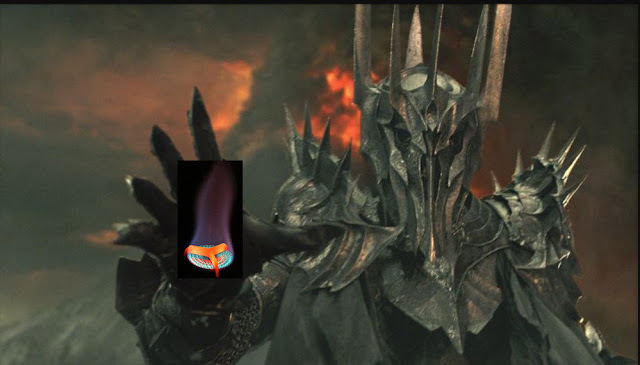 A fire steel (ferro rod). An MSR Reactor operating just fine at over 23,000'/7000 m elevation on Muztagh Ata (24636'/7509 m) in China. Photo credit: Reuben Brimfield. Used by permission. The "Proof of the Pudding"
If somehow you're not yet convinced that canister stoves not working at elevation is a myth, don't believe me; believe the mountaineers. What are more and more world class mountaineers using? Canister gas stoves. Note in the above photo that a canister gas stove is being used at over twenty three thousand feet in elevation. That's over 7,000 meters above sea level. This is far higher than most of us will ever climb. Mountaineers know their business. Mistakes in high elevation mountaineering are frequently fatal. Why do mountaineers use canister gas stoves? Because they work. Use by mountaineers tells us all we need to know about the myth of poor performance by canister stoves at high elevation. It's just that, a myth. Thanks for joining me as I engage in a bit of "myth busting."